Amaterasu is one of the playable Gods in SMITE. As the first rays of dawn cross the horizon, before all else they touch the land of the rising sun. A realm of islands painted with the careful brush strokes of its deities. That morning light, which brings warmth and life is Amaterasu, the benevolent Goddess of the sun. Universally, she is adored. Less so are her brothers, namely Susano-o, bringer of storms, whose jealousy of his sister's popularity drove him to burn her golden rice fields and shatter the sacred looms of her people. Grief stricken at the destruction, Amaterasu sealed herself inside a deep cavern. Her people suffered and the realm fell into crushing darkness. For an unknown time, she stayed there, hidden away from the atrocities of the world. Until, one day, came a thumping from outside. At first, she tried to ignore it, but curiosity called. Moving aside the great stone sealing the cavern, she peered cautiously out, only to stare into a polished bronze mirror. Blinded by her own reflection, Amaterasu was forced to creep further out to find the source of the sound. Hands grabbed her from either side and pulled her free of the cave. Gathered around were hundreds of friends and loved ones. Atop a wide tub danced Usume, Goddess of Mirth, creating the erratic drumming to the joy of all. Amaterasu smiled and light came back to the world. Seeing all those that depended on her, all those that loved her, Amaterasu vowed never again to hide away from calamity. She would, instead, face it, just as the dawn rises each new day. Heals for up to 60/100/140/180/220 (+20% of your physical power). Valor grants both Physical and Magical Power. Can deal up to 270/450/630/810/990 (+150% of your physical power) damage. Plays a distinct bell chime noise for each stage of the chain. 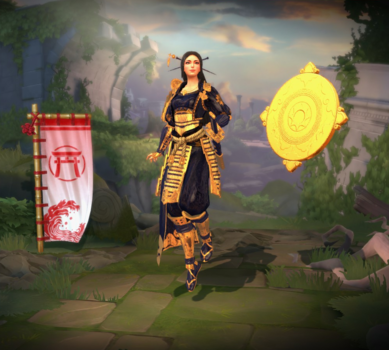 Amaterasu is Susano's sister and is Izanami's daughter. 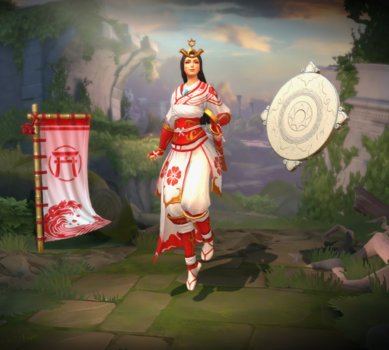 Amaterasu was the first Japanese goddess in the game. 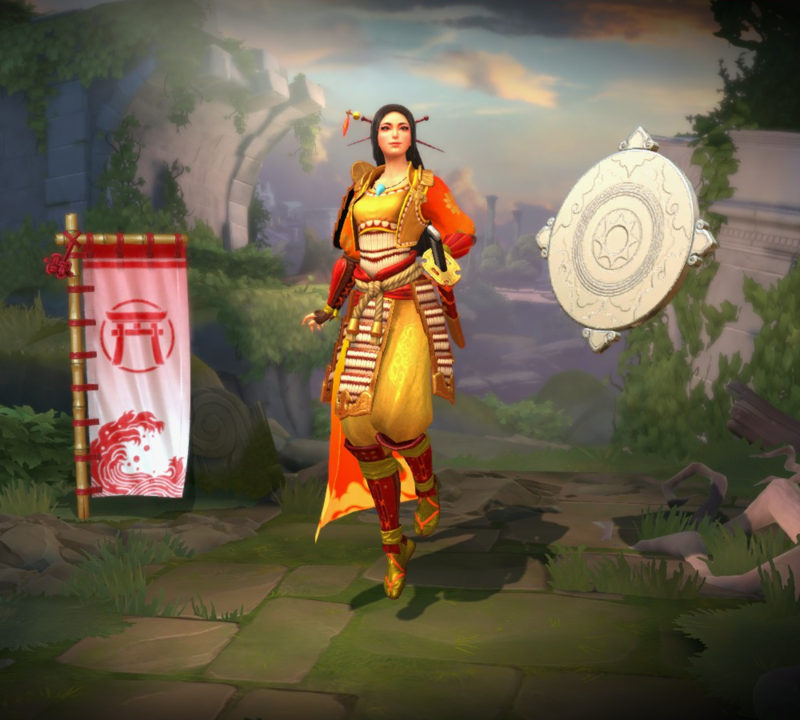 Amaterasu was the first god released in 2016. Amaterasu's ultimate, Dazzling Offensive, is similar to Guan Yu's original ultimate, Tactician's Advantage, prior to his rework. The actress who voiced Amaterasu, Cristina Valenzuela, also voiced Discordia and Sea Maiden Medusa. The card art for the skin is based on a painting that portrays Amaterasu leaving the cave she was hiding from Susano's rage. The color of Amaterasu's clothes could be a reference to the main character from the game Okami, who shares the same name. 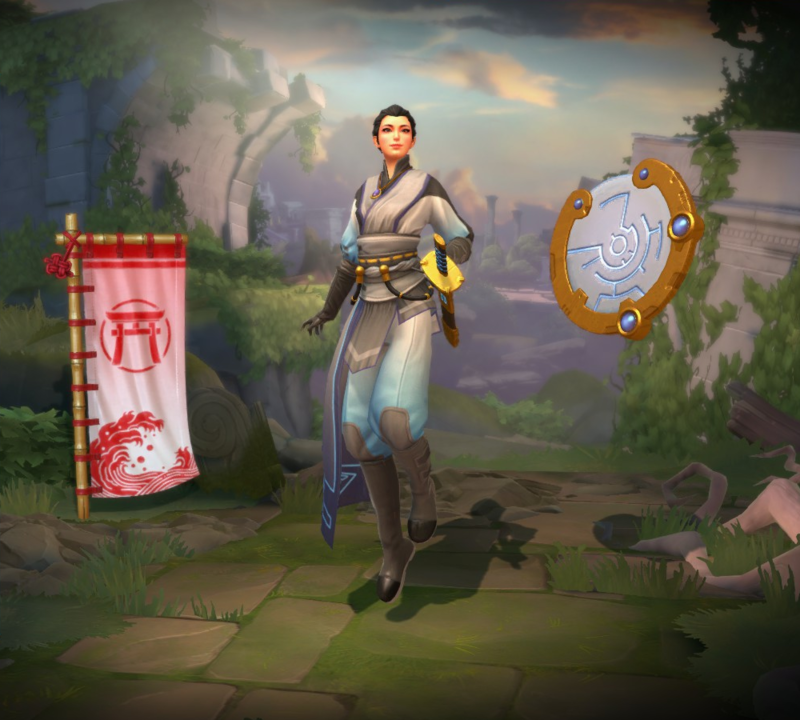 This skin is based on Rey from the Star Wars movies. This skin shares its theme with Intergalactic Chang'e, Ordo Aurora Freya, Dark Lord Sun Wukong and SWC 2016 Zeus. Several of Foxy Amaterasu's voicelines, including her joke "Why does everyone keep asking me what I say? ", are references to the song "The Fox" by Ylvis. This skin and Default Amaterasu were both voiced by Cristina Valenzuela. 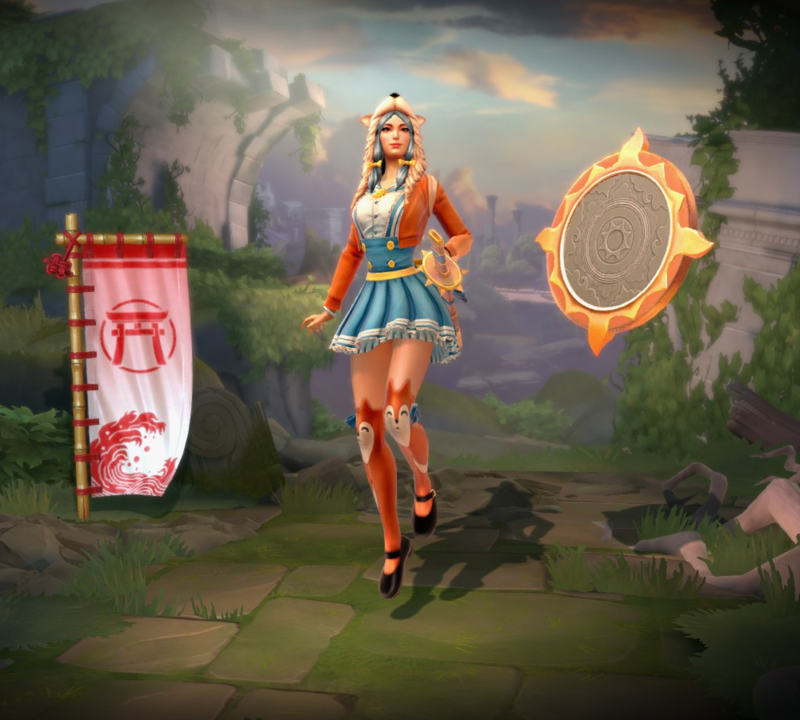 This skin share its theme with Kawaii Pop Bastet, Harajuku Neith and Such Cold Skadi. 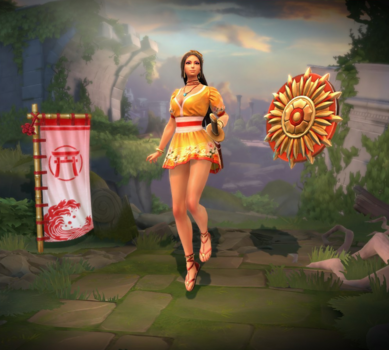 This skin shares its theme with Beach Babe Aphrodite, Life's a Beach Geb, Hunkules Hercules, Pool Party Jing Wei, Chef's Special Khepri, Challenger/Ace Nu Wa, Land Shark Sobek, Poolseidon Poseidon, and SPF 666 The Morrigan. In the wallpaper version of the card art, a chibi Susano can be seen on the background. 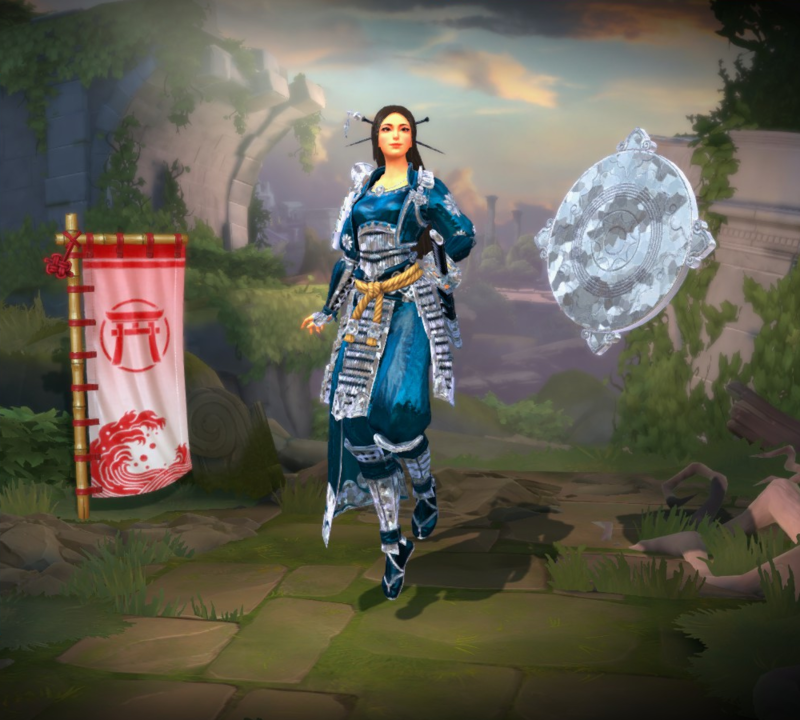 Ama is one of the few humanoid gods who have a chibi skin. This skin shares its theme with Itty Bitty ChiBee Ah Muzen Cab, Chompy Chibi Fenrir, Heebee Chibi Hades, Breezy Chibi Kukulkan, Beamy Chibi Ra, Steamy Chibi Sol and Beaky Chibi Thoth. Her intros are references to how the SWC trophy is based on Thor's hammer. 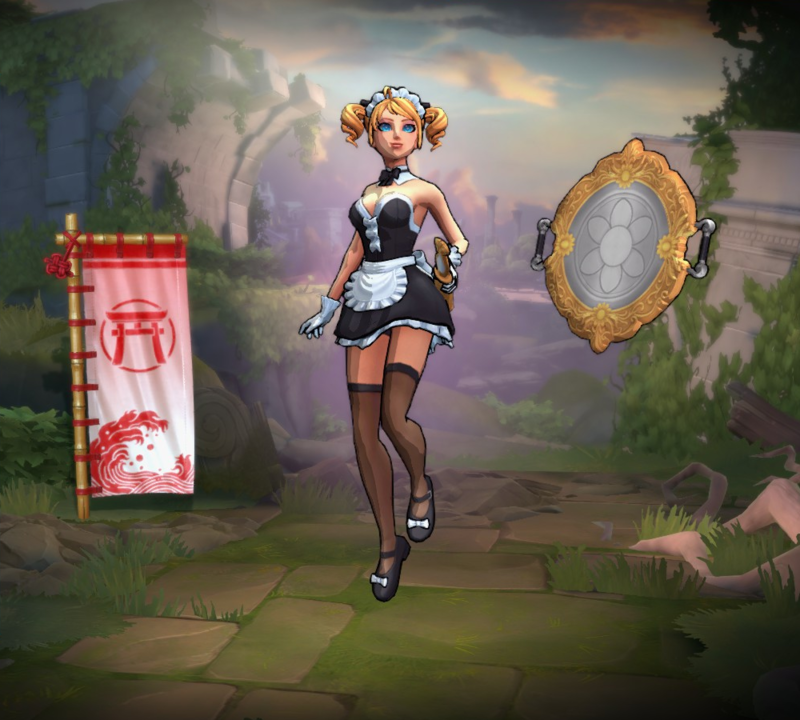 This skin is most likely based on the Maid Cafés that are very popular in Japan. This skin uses cell shading. Fixed an issue where Amaterasu's ultimate would appear to play more than 3 times in a single fire. Decrease Power Buff on Valor Aura from 15/20/25/30/35 to 10/15/20/25/30. Decreased Cooldown from 14s to 12s. Reduced damage from 50/100/150/200/250 → 50/90/130/170/210. Amaterasu has been added to the game.